Having problems where Microsoft Windows 10 won’t go into sleep mode? 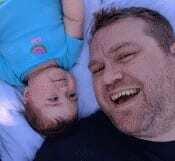 This tutorial will help you figure out the problem. Select the “Start” button, then select “Settings” (gear icon). Ensure the “Sleep” setting is set to a desired value. 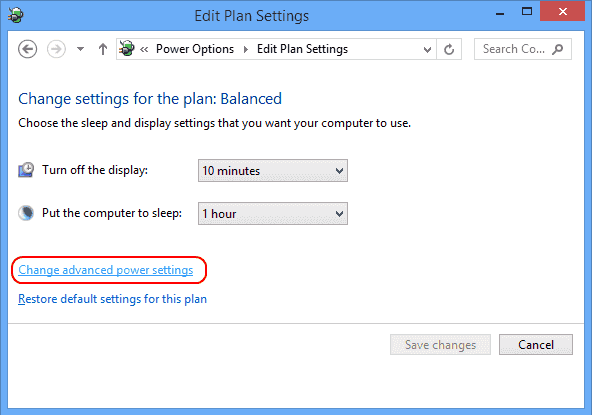 Select “Additional power settings” in the right pane. Select “Change Plan Settings” next to the option that you have selected. 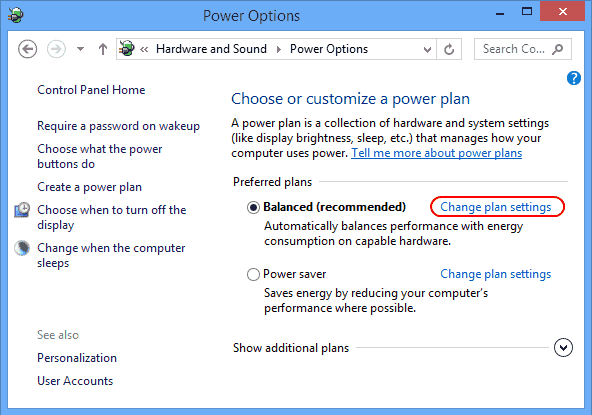 Select “Change advanced power settings“. 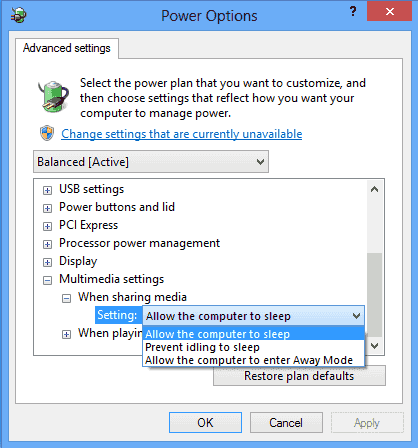 On the “Power Options” screen, you want to expand each setting and ensure that they allow the computer to go to sleep mode. In my case, the setting under “Multimedia settings” > “When sharing media” was set to “Prevent idling to sleep“. I had to set this to “Allow the computer to sleep“. If you’re feeling lazy, just hit the “Restore plan defaults” button and that should toggle all items to where sleeping is allowed in Windows 10. If you have a sensitive mouse, any vibration near your PC could be keeping your machine awake. Try these steps to prevent the mouse from waking your machine. Select the “Start” button, then type “device“. Expand the “Mice and other pointing devices” section. Right-click on the mouse you are using, then choose “Properties“. Select the “Power Management” tab. 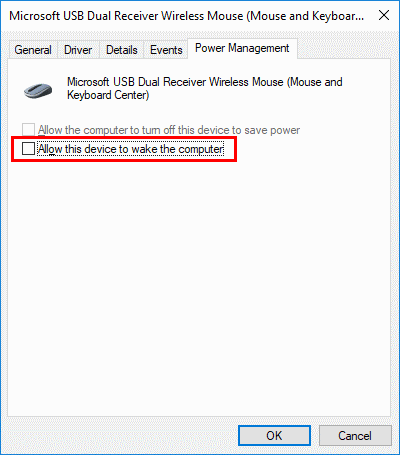 Uncheck the “Allow this device to wake the computer” box, then select “OK“. These steps are the same as Fix 2, only you’re checking under “Network adapters”. Expand the “Network adapters” section. Check under each of the options by right-clicking and selecting “Properties“. Uncheck the “Allow this device to wake the computer” box, then select “OK” for each network card. If you still have problems with your Windows 10 computer sleeping, there may be a program that is constantly running on your PC that keeps it awake, or even worse, a virus. Use my Bible For Making Your Windows Computer Run Faster to gain control over what’s running on your PC. I tried everything on this list and it didn’t work. If that happens to you, consider replacing your mouse. Even though it wasn’t moving, mine was constantly “on” and scanning the mouse pad. As soon as I replaced my mouse, everything started working as it’s supposed to. My old mouse was a Razer Ouroborus; new one is a Razer Mamba. Thank you. Like most others in the list I was frustrated by on-all-the-time monitors even with the sleep time set to 15 minutes. Changing the multimedia setting worked. Thanks a lot for the tip! That saves me from troubles. MS support people should know these. I called them twice and both times it was a default to “re-install windows”. My computer hasn’t been falling to sleep or activiting the screen saver for some time now. Step 8 solved my problem. I would never have figured that out! Thanks!! Your Fix 3 – Network Adapters resolved (now my desktop goes to hibernate/sleep!) my issue (i.e. desktop not going to hibernate/sleep). You have no idea how much hassle you have saved me after months, years even of this pesky little problem. I was on the verge of begining to start editing system files based on trial and error from thousands of theories on the internet. Thank you, kind stranger. OMG…this was a life saver!!! I often need my pc to sleep not hibernate or shut down, so when I started popping back on when I put it to sleep I thought I was gonna pull my hair out and scream. Your instructions were ssoooooo easy to understand & follow for a totally non-technical Grandma. I appreciate your help, thank you very much.